Today, as part of Computex 2017, Qualcomm and Microsoft are joint announcing the next steps for their Windows on Snapdragon strategy. As previously reported, Qualcomm and Microsoft have collaborated to emulate x86 on the Snapdragon 835 SoCs to the extent where Windows 10 is now functional for devices to come to market. ASUS, HP and Lenovo will be the first OEMs to adopt the platform, which means we will see devices (laptops, clamshells, 2-in-1s) with Windows 10 but running on ARM. 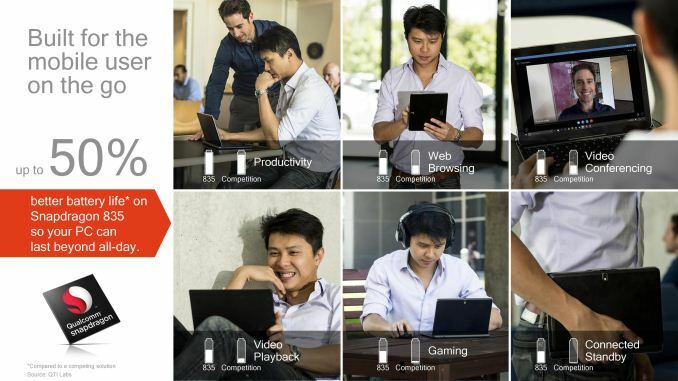 Qualcomm notes that the ubiquitous connectivity akin to smartphones is becoming an important aspect to how users use their computers as well as consume content – introducing the Snapdragon 835 on a productivity platform combined with the integrated Gigabit LTE baseband (Qualcomm’s X16) is a step in that direction along with mobile SoC levels of power draw. When we first heard about Windows on Snapdragon, we instantly thought that Qualcomm and Microsoft would be going after the Chromebook market but the announcement today is clear that both companies are going for something a bit more substantial along with all-day battery life. The official press release states that ‘Sleek, thin and fanless PCs running a Windows 10 experience’, with the 10nm SoC, sounds something more than a basic Chromebook. One might suggest that the Snapdragon 835 is a premium SoC, and Qualcomm certainly wants to promote their hardware in high-end premium devices. 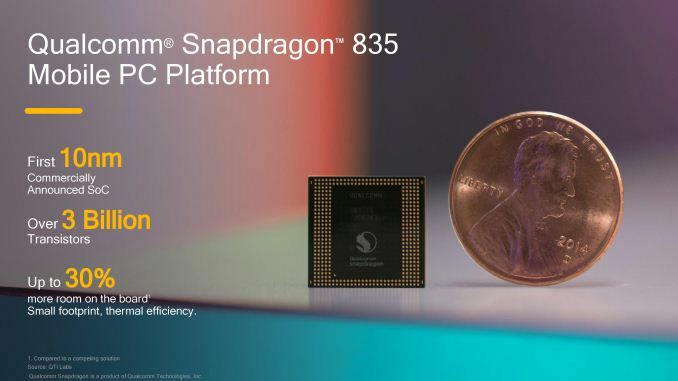 With Snapdragon 835 in high-end smartphones, one of the elements Qualcomm is promoting is the fact that their SoC solution has a smaller PCB footprint: OEMs can use the extra space and weight for extra battery. This is part of the story which Qualcomm states allowing a ‘truly always on’ device such that updates can run in the background when the system is in sleep modes. Part of the demonstrations at the Computex show floor, Qualcomm was showing Windows 10 being used with UWP applications but also some non-UWP apps being used, such as 7-zip. The OS element is something we’re likely to hear during Microsoft’s announcements during the week, which I feel might be a tipping point for these sorts of platforms. I’ve been using the MateBook X this week during Computex, and the battery life is actually fairly decent for an 1800 Euro ultraportable with a 15W CPU: but there’s still a small amount of battery anxiety for sure, especially during network use. Qualcomm’s value-add is their baseband experience, which they say is a big plus on this new platform. Having a proper productivity device is a plus, but big questions still surround performance, especially when emulating x86. It’s a problem that has been tackled and failed several times before. The Qualcomm issue here is somewhat smaller than previous attempts, because as far as we understand it only has to target Windows 10, and they’ve worked directly with Microsoft in order to support it. 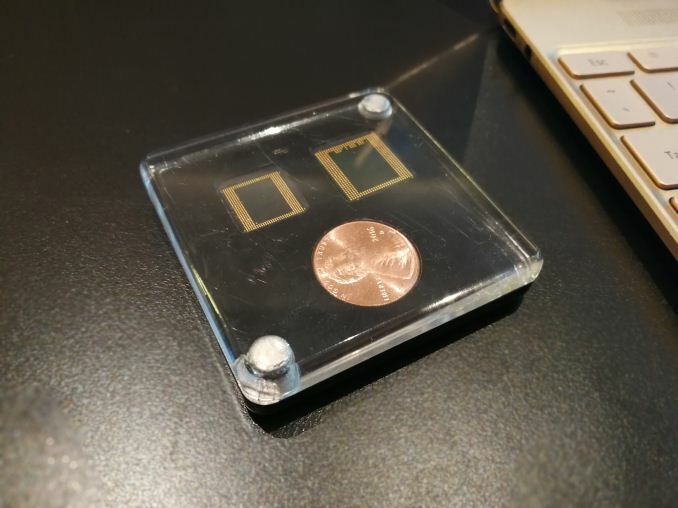 Qualcomm and Microsoft say that this combination is now a solved problem with minimal overhead. The carousel image at the top shows the S835 compared to a 14nm equivalent, showing the 'board space' savings of up to 30%. Qualcomm is keen to point out that a competitor's platform will need things like M.2 in order to add storage, which they say also take up board space compared to a Qualcomm solution. 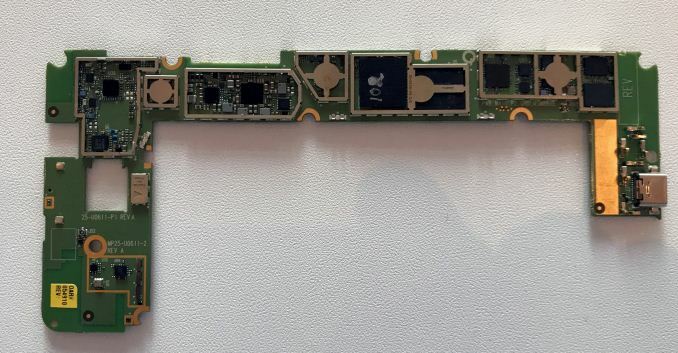 As part of our briefing, Qualcomm showed off an example reference PCB design that might go into the devices that they are targeting. The SoC is on the top right, with storage and memory to the left. It's worth noting on the far right is a USB Type-C connection, which would be the power input as well as how to connect other devices. There is no SIM card, as Qualcomm is integrated a multi-region eSIM which is activated at the time of purchase.